Buddy Hield was part of the NBA All-Rookie First team in 2017. Buddy has led the charge on the offensive end for the Kings for quite some time now. His quickness and agility coupled with the skill to get quick buckets is something which often goes unnoticed. 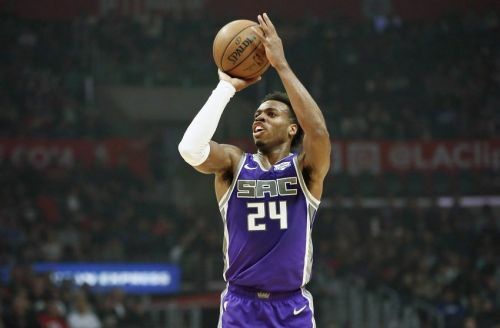 At 26 years of age, this season can be considered a breakout campaign for Hield as he averages a career-high 20.5 ppg, shooting a dazzling 46% from the distance. Of all the players in this list, he has attempted the least number of threes (391) and pulled through to make 180 of them at an astronomically high-efficiency rate. He is the leading scorer for Sacramento this year, shooting an impressive 48% from the field and 84% from the foul line. Some of his highlights include a blazing 8-of-13 show from downtown in a hard-fought loss against the Warriors this past month, followed by a one-legged buzzer beater against the Pistons for a 103-101 win.